According to the manufacturer's specifications, the systems weigh from 15 to 320 pounds (6.8 to 145.1 kg) and can emit sound in a 30–60° beam at 2.5 kHz. The manufacturer also produces systems for public address and mass notification use that broadcast 360°. LRAD systems are used by law enforcement, government and defense agencies, as well as maritime and commercial security companies to broadcast audible notifications and warnings over distance. LRAD systems are also used to deter wildlife from airport runways, wind and solar farms, nuclear power facilities, gas and oil platforms, mining and agricultural operations, and industrial plants. The parameter "ka", which is the wave number multiplied by the speaker radius, is often used to characterize sound source directivity. For this source, ka=19 at 2.5 kHz, and according to the LRAD data sheet, the beam angle of about 30 degrees total is what is predicted for a regular loudspeaker. Small spherical "point-source" acoustic devices follow the known inverse square law, which predicts the loss of 6 decibels (dB) per doubling of distance from the source, solely due to geometric spreading. Large speakers (or large arrays), such as these, have an interference pattern in the nearfield which produces peaks 6 dB higher than the output pressure and nulls where the pressure is essentially zero. The larger the speaker, and the higher the frequency, the longer the effective nearfield. The nearfield for this device is approximately 8 metres (26 ft). LRAD Corporation was formerly named American Technology Corporation. 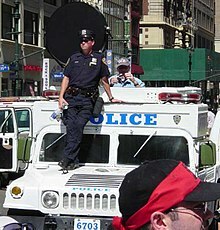 An LRAD was present during protests of the 2004 Republican National Convention in New York City but not used. LRADs were used by the Pittsburgh PD during protests at the G20 Summit in September 2009. This was the first time it was used during a protest in the U.S.
Israel's Ministry of Defense ordered LRADs in June 2011. The Delhi Police are purchasing five LRADs for crowd control while the Polish Police also acquired LRAD units in December 2010. LRAD was present, but not used because of current legal regulations during protests in Poland, including Million Marijuana March 2011 and Marsz Niepodległości (National Independence Day March) 2011 and 2012. Lacking a way to utilize the LRADs purchased to their full potential sparked an investigation suspecting corruption behind their acquisition. National Police Headquarters spokesman Mariusz Sokolowski defended the purchase of LRAD. He also stressed that the police decided to make this investment because, "We needed good sound reinforcement equipment. With numerous demonstrations and gatherings, police need a public address system that allows you to reach thousands of people." LRAD was deployed during a NATO march on May 20, 2012 in Chicago, Illinois at Michigan Ave. & Cermack. The Salisbury, MD Police Department acquired an LRAD in October 2013 with proceeds from their speed cameras. During 13 to 18 August 2014 the St. Louis County police used LRAD during protests surrounding the police shooting of Michael Brown in Ferguson, Missouri. Reporter Mike Tobin commented while broadcasting from Ferguson, MO on 18 August, "It doesn't have the effect of crippling people. It's just loud, it's annoying, it lets you know something big and official is coming and that's what's happening now. They can also use it as a loudspeaker to tell people to get out of the way." On December 5, 2014, the NYPD utilized an LRAD, notifying approximately 100 protestors to disperse, during the protest of the police killing of Eric Garner in Midtown Manhattan. Myrtle Beach, South Carolina police obtained two LRAD systems through a federal grant in March 2015. Myrtle Beach police captain Marty Brown told the Myrtle Beach city council that "his department is getting the LRADs to enhance their communication capabilities be it with large crowds or for emergency announcements such as evacuation orders." The NYPD used a Long Range Acoustic Device during the Baltimore solidarity rally in Union Square on April 29, 2015. An NYPD pickup truck equipped with an LRAD parked near protesters and broadcast a looped warning message about staying off the streets and not blocking the sidewalks. The New Jersey State Police used an armored-vehicle-mounted LRAD to communicate with crowds denied entry to a June 7, 2015 concert after they began throwing bottles and tried to rush the gates outside MetLife Stadium. On June 26, 2015, Czech Special Forces Police may have deployed an LRAD 500X during anti-immigration and anti-Islam protests in Brno, the second largest city in the Czech Republic. The Greensboro, NC Police Department (GPD) purchased an LRAD 300X and demonstrated it for reporters in November 2015. Captain Jonathan Franks with GPD says it can be used for alerts for everything from riots to missing children to weather disasters. "I am sure, positive, 100% that in certain instances it will be able to not only save one life but numerous lives," said Franks. Police in San Diego, CA used an LRAD on May 27, 2016 to order anti-Trump protesters to disperse. On October 27, 2016 police from several agencies, including North Dakota state troopers, the National Guard, and other law enforcement agencies from surrounding counties and states deployed two LRADs to clear a protest camp and blockades along Highway 1806. "Long Range Acoustic Devices, which emit an ear-splitting whine, were used intermittently throughout the day" one reporter wrote. An LRAD was present again on 11/20/2016 at the bridge just north of the protesters camp on highway 1806. The Columbus, OH Police Department (CPD) demonstrated a Long Range Acoustic Device to the local media on November 21, 2016. CPD expects to use the device for crowd control, barricaded suspect operations, and to communicate to residents during emergencies and natural disasters. The Washington D.C. Metropolitan Police Department used a LRAD at the January 21, 2017 Women's March. On February 17, 2017, the Princess Anne Police Department deployed its LRAD system at the request of the Maryland State Police to disperse an unruly concert crowd on the campus of the University of Maryland Eastern Shore. Chief Tim Bozman of the Princess Anne Police Department said, "Its a very good piece of equipment for incidents like this." The Mendocino County (California) Board of Supervisors approved the purchase of a Long Range Acoustic Device for the Mendocino County Sheriff’s Office on April 18, 2017. "Sheriff Tom Allman said the device will aid in searches for missing persons, most often hunters and mushroom pickers, which cost the county tens of thousands of dollars. Allman recalled the 2011 search for Aaron Bassler, who had been accused of murdering two men in Fort Bragg and led law enforcement officers on an intense manhunt in the Noyo Basin, saying the LRAD might have made that search a little easier. He said it could also be used to warn residents in case of a tsunami. Last year, MCSO was able to test an LRAD out of a low-flying plane along the coast, and it proved sufficient. He also said the LRAD could prove a valuable asset in a barricaded-person situation (a person hiding out from officers in a building) to communicate from the outside of the building, which has happened before.". The Phoenix, AZ city council approved the purchase of two LRAD 500X systems in November 2018. The speakers will “provide an ability for us to give clear and concise messages to groups of people whenever we find it necessary to communicate with them,” according to Sgt. Mercedes Fortune. LRAD emergency communication systems were demonstrated to city and county officials in Muskogee, Oklahoma in February 2015. "A warning system doesn't do much good if there's devastation and you can't communicate after that warning," said Muskogee Mayor Bob Coburn. "If your cell phone is down, your land line phone is down, [and] your power is out then you still have access to communicate and this [LRAD] has that potential." An LRAD mobile mass notification system was demonstrated near Wimberley, Texas in January 2016. Severe flooding in the area claimed several lives and destroyed hundreds of homes in May 2015. For its multi-week March 2016 event, the Houston Livestock Show & Rodeo had an LRAD mass notification system on the grounds in case attendees needed to be warned of emergencies or extreme weather events. San Jose, CA city officials ordered three long range acoustic hailing devices after complaints that the city did not adequately notify neighborhood residents of rapidly rising floodwaters in February 2017. San Jose, CA city officials tested its LRAD emergency alert system in October 2017, 8 months after the February 2017 Coyote Creek floods. Menlo Park and Atherton, CA police and fire officials attended a 'sound off' between a siren installation and an LRAD 360XT mobile voice mass notification system in April 2018. "The side by side test was very helpful and everyone agreed that the LRAD system completely outperformed the older siren system," said Fire District Emergency Manager Ryan Zollicoffer. "Not only because of the voice capability, but the modular-mobility benefit is something that appeals to first responders because it can be used for a variety of public safety purposes and better moved around if that's needed or desired." "LRAD, meaning Long Range Acoustic Device, is a high powered speaker system that North Bay fire departments are interested in acquiring. The system emits a shrill sound followed by spoken instructions such as "shelter in place" or "wildland fire, evacuate now." The speakers would be strategically mounted on structures to cover wide areas or be mobile to evacuate specific areas. While all kinds of media will remain crucial, everything from mass media to social media to wailing air raid sirens, this is the system that cannot only wake you up, but inform you as to what's going on, immediately. "It was a third to a half mile away that we had an engine company positioned and it wasn't a straight shot. it was down the road and around a turn a little bit, and they were hearing the message loud and clear," said Marin County Fire Department Deputy Chief Mark Brown. The Singapore Navy is equipping its new fleet of eight Littoral mission vessels with Long Range Acoustic Devices. The Vietnam Coast Guard is deploying LRAD on its vessels. RPB 33 coastal patrol boats in service with the navies of Senegal, Togo and Ivory Coast are equipped with LRADs for communication over long distances. Japan's Coast Guard used Long Range Acoustic Devices and other methods to expel a North Korean fishing flotilla from its waters in September 2017. On November 5, 2005, the luxury cruise ship Seabourn Spirit employed an LRAD to repel pirates who attacked the vessel with rocket-propelled grenades about 115 km off the coast of Somalia. The effectiveness of this device during the attack is not completely clear, but the pirates did not succeed in boarding the vessel and eventually fled. The Liberian vessel MV Biscaglia was attacked on November 28, 2008. The security detachment aboard Biscaglia claimed to have used an LRAD device in an effort to repel attackers armed with assault rifles and rocket-propelled grenades. Following a one-sided shootout, the ship was seized and the unarmed security contractors abandoned ship leaving the ship and crew to the pirates. The incident caused the usefulness of LRADs to be called into question by Lloyd's List. In August 2013, Carl "Rocky" Mason, one of the three members of the security attachment aboard the Biscaglia during the incident, stated that an LRAD was aboard, but that he and the security attachment only had time to open the water cannons before gunfire and an RPG round forced them to abandon ship. No attempt was made to use the LRAD device during the incident. In January 2011, the Spirit of Adventure, a cruise ship sailing through the Indian Ocean, deployed an LRAD system as part of its defensive measures when being pursued by pirates. S/Y Hideaway used an LRAD in 2016 to deter suspected pirates in the Gulf of Aden. It was confirmed by the Ministry of Defence on May 11, 2012 that an LRAD would be deployed in London during the Olympics. It was spotted fixed to a landing craft on the Thames. Singapore's Changi airport is using an Airside Safety Rover equipped with a long range acoustic device (LRAD) to chase birds off runways. In February 2009, the Japanese whaling fleet operating in Antarctic waters near Australia installed LRADs on their vessels. The device was used against activists of the Sea Shepherd Conservation Society. 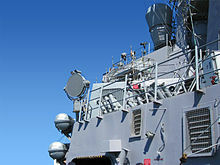 The Japanese fleet later escalated the use of LRAD, deploying it against a Sea Shepherd helicopter carrying a camera crew. Sea Shepherd noted that they had an LRAD of their own, but as of early 2010, had not put it into use other than to play a recording of "Ride of the Valkyries" in the manner of attacking U.S. Army helicopters depicted in the 1979 film Apocalypse Now. Australia: Victoria Police, the Western Australian Police, the South Australia Police, the Queensland Police Service and the Australian Federal Police have confirmed they have purchased the devices. Vietnam: Being used on-board DN-2000-class ships of the Vietnam Coast Guard's fleet. ^ a b Blackstock, David T. 2000. Fundamentals of Physical Acoustics, p.456, John Wiley and Sons. ^ Martin, Adam (25 October 2011). "Occupy Oakland's Tent City Is Gone". The Atlantic Wire. Retrieved 26 October 2011. ^ "Occupy Wall Street: Police use military megaphone to amplify their point to protesters". Daily News. New York. 18 November 2011. Retrieved 15 February 2015. ^ "Exclusive: Delhi Police to use high-tech sound device to disperse unruly protesters". intoday.in. ^ "MOBILNY LRAD-500X NA PŁYTĘ BOISKA". policja.waw.pl (in Polish). 11 August 2008. ^ "Potężna broń służy jako zwykły głośnik. Policyjny system LRAD pod lupą prokuratury". rmf24.pl (in Polish). 9 January 2013. ^ "As it Happens: NATO in Chicago". NBC Chicago. ^ Bill Mich (8 October 2013). "Salisbury Police Utilizing New LRAD System". wboc.com. ^ "DAY FIVE WRAPUP: McCulloch blasts Nixon for replacing St. Louis County Police control". St. Louis Post-Dispatch. August 14, 2014. ^ "Video: NYPD Uses Military-Grade Sonic Weapon on Eric Garner Protesters". Alternet. ^ Tom O'Dare (19 March 2015). "Myrtle Beach police going high-tech for Bikefest". myhorrynews.com. ^ NYPD LRAD warning message for protesters 4.29.15. YouTube. 29 April 2015. ^ Justin Davis. "Police Deploy Tear Gas on Crowds Outside of Hot 97's Summer Jam - Complex". Complex. ^ "Do Brna se kvůli demonstracím sjeli policisté ze Speciálních pořádkových jednotek z celé republiky". policejnidenik.cz (in Czech). June 26, 2015. ^ Benjamin F. Powell (5 November 2015). "GDP: New Long Range Audio Technology Could Save Lives". wfmynews2.com. ^ "Police order anti Trump protesters to disperse". ^ Enzinna, Wes. "I Witnessed Cops Using Tear Gas, Rubber Bullets, and Sound Cannons Against Anti-Pipeline Protesters". Mother Jones. Retrieved 7 November 2016. ^ Ted Hart (21 November 2016). "CPD demonstrates new crowd control device". nbc4i.com. ^ Henry Culvyhouse (17 February 2017). "UMES concert canceled due to unruly crowd". www.delmarvanow.com. ^ Ashley Tressel (18 April 2017). "New loudspeaker ensures MCSO will be heard loud and clear". Ukiah Daily Journal. ^ "Phoenix police pick up approval, $95K for long-range, crowd-control speakers". www.ktar.com. 10 November 201. ^ Melissa Hawkes (26 February 2016). "The City Of Muskogee Considers Emergency Communication System". NewsOn6.com. ^ Mark Hughes (27 February 2015). "Tech firm shows new long-range PA system". muskogeephoenix.com. ^ Dalton Sweat (14 January 2016). "Wimberley flood siren". youtube.com. ^ KVUE staff (9 June 2015). "12 dead, 2 children missing in Memorial weekend flooding". kvue.com. ^ Jonathan Martinez (8 March 2016). "Rodeo officials prepare for looming storms". click2houston.com. ^ Craig Hlavaty (8 March 2016). "RodeoHouston staff ready for whatever Houston's weather throws at them". chron.com. ^ "Emergency proclamation in San Jose ratified, waives permitting fees to flood victims". www.ktvu.com. 28 February 2017. ^ "New LRAD emergency alert system tested in San Jose 8 months after Coyote Creek floods". www.ktvu.com. 23 October 2017. ^ Susan C. Schena (20 April 2018). "Siren vs. Voice: Mass-Evacuation Systems Tested". Menlo Park-Atherton, CA Patch. ^ Lisa M. Krieger (20 November 2018). "Lessons from Camp Fire: Staying alive in California fire country". www.mercurynews.com. ^ Tom Vacar (5 December 2018). "Using LRAD to alert for fire emergencies". www.ktvu.com. ^ Maggie Avants (15 December 2018). "Emergency Siren Testing Planned Near Healdsburg: Fire Department". patch.com. ^ "Singapore Navy launches second littoral mission ship". NavalToday.com. ^ "Việt Nam có thể ưu tiên mua sắm, trang bị vũ khí nào của Mỹ?". Anninh Thu do. ^ "RPB 33 Offshore Patrol Boat, France". naval-technology.com. ^ "Japan coastguard expels North Korean fishing flotilla". ftchinese.com. ^ "I beat pirates with a hose and sonic cannon". BBC News. May 17, 2007. Retrieved May 11, 2010. ^ David Osler, (2 December 2008). "Sonic solution may not be a sound investment", Lloyd's List. London: Informa. Retrieved 13 April 2011. ^ "Pirate hunter: How a British ex-Marine and bodyguard to the stars escaped death fighting the most feared hijackers on the high seas - only to find they were run by a secret network of Somali spies in London". Mail Online. ^ Sloan, Gene (January 17, 2011). "Cruise ship blasted pirates with sonic wave". USA Today. Retrieved July 17, 2011. ^ William Bruton (February 2017). "Standoff". www.dockwalk.com. ^ "'Sonic weapon' deployed in London during Olympics". BBC News. 12 May 2012. Retrieved 11 May 2012. ^ "Lasers and giant speakers: How airports chase birds off the runway". mashable.com. 17 August 2017. ^ Darby, Andrew (February 6, 2009). "Whalers attack activists at sea". The Age. Melbourne. ^ Sea Shepherd Conservation Society USA. "Video - Operation Waltzing Matilda". Operation Waltzing Matilda - Sea Shepherd Conservation Society. Archived from the original on 2010-01-03. ^ "Street Fight on the High Seas". The New Yorker. 2010-01-12. Retrieved 2010-01-16. ^ "Ride Of The Valkyries: Japanese Whalers Claim Sea Shepherd Harasses The Nisshin Maru With Classical Music". Underwatertimes.com. Tokyo. February 9, 2010. Retrieved January 1, 2011. ^ "La police de Montréal se dote de canons à son". La Presse. Wikimedia Commons has media related to Long Range Acoustic Device.